Matthew Ito is one of 600,000 Americans who have the disorder called Familial Hypercholesterolemia (FH). Unfortunately, 80 percent of those with FH are undiagnosed and have no idea that they are at risk. (NAPSI)—Information shared by family members can often serve as the first line of defense against a serious medical condition. Such shared information was key to saving the life of a young man named Matthew Ito. As a teen, Ito did all the things other 14-year-old boys did: played sports, hung out with friends, and raced dirt bikes. But around that time he also learned he had inherited a potentially deadly genetic disorder that affects 1 in 500 people. The disorder, called Familial Hypercholesterolemia (FH), affects more than 600,000 Americans, yet 80 percent of those with FH are undiagnosed and have no idea they are at risk. When Ito was diagnosed in 1974, the medical community didn’t have ideal guidance or treatment for it. In fact, he wasn’t treated for FH until he was in his late 20s, just after statins, a class of drug used to lower cholesterol, were introduced. The only thing standing between him and a life-changing—or life—ending-heart attack was a semi-strict diet and exercise. “When I’d go out with my friends, my mom would make me a healthy snack and everyone else would be eating hamburgers,” said Ito, now a professor of pharmacy practice at Oregon State University/Oregon Health & Science University. After further tests and family research, he learned that FH came from his mom’s side of the family. Both of his maternal grandparents had died from either a stroke or a heart attack. Numerous aunts, uncles and cousins have FH as well. The consequences of FH have dramatically altered his life. Ito is in the midst of a fight against FH, not only for himself, but also for the life of his patients and his own family. “Even though I’m being treated with statins and ezetimibe (a cholesterol absorption inhibitor), I eat an extremely healthy, low cholesterol and low sodium diet. I was undiagnosed for 14 years of my life, and it took its toll,” Ito said. As a Doctor of Pharmacy and President of the National Lipid Association (NLA) this year, he is committed to raising awareness about this disorder. Ito wants both patients and health care providers to know exactly how important early diagnosis and treatment is, from his personal—and life-threatening—experience. 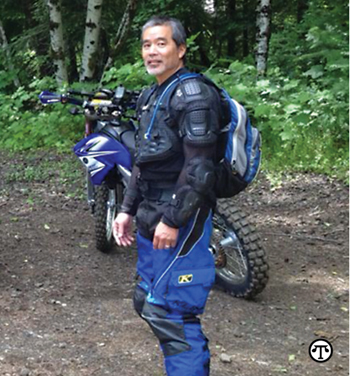 Despite a strict diet and doing everything “by the book,” in January 2013, Ito had a massive heart attack and two weeks later underwent triple bypass surgery. Knowing his family history, Ito made sure that his now 18-year-old daughter and 13-year-old son were screened for FH, done with a simple blood test. Results showed that his daughter also inherited FH but his son did not. “Thankfully my daughter is doing well, and she is now on statins, but it’s something she will have to learn to live with and be aware of the rest of her life,” said Ito. But not many doctors do cholesterol screening on children who appear perfectly healthy, and not many children have lipidologists as fathers. “Many people with FH don’t have any obvious symptoms of high cholesterol; they are not obese; they don’t eat unhealthy foods; and they exercise. That’s why it’s so difficult to diagnose—and often those with FH only get diagnosed after they’ve had a heart attack or stroke. If patients suspect they may have FH or have a family history of heart attack or stroke, I advise them to get screened for FH. Because it could end up saving their life,” said Ito. While FH is not curable, it is treatable. The aim of treatment is to reduce your cholesterol to an acceptable level, thereby preventing or delaying heart disease. A lipidologist, a health care provider who specializes in treating diseases like FH, can develop the best treatment plan for you. To locate such a health care provider or to learn more about FH, visit the website at www.learnyourlipids.com.